That’s how Rep. Jim Jordan, chairman of the House Republican Study Committee, put it recently, in defense of $109 billion of reductions to budget authority that are set to take place at year’s end — much of which would come from the defense budget. He’s right. 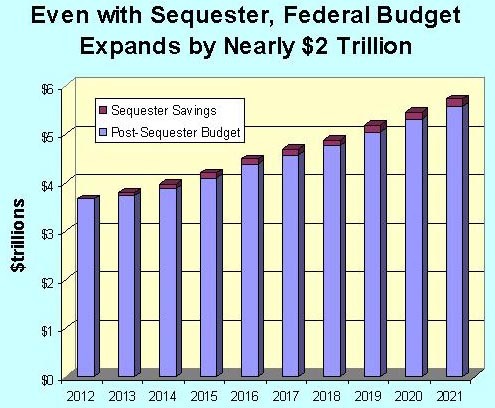 If Congressional leadership and the Obama Administration cannot keep even the modest spending cuts proposed from sequestration — which would reduce the overall budget by just 1.7 percent — how do they ever intend to balance the budget? Even if members of Congress disagree with the composition of the cuts — which includes a $54.7 billion reduction in defense budget authority — with a $16.24 trillion debt that will climb to $26 trillion by 2022, they should fight for offsetting spending cuts elsewhere in the budget, not cancel sequestration all together. Unhelpful to that end are reports promising economic devastation should the cuts be allowed to go into effect, such as from the Congressional Budget Office. That study finds the annualized Gross Domestic Product (GDP) reported by the Bureau of Economic Analysis will be reduced by as much as -0.75 percent in 2013 with the cuts. What the CBO leaves out of its analysis is that because government spending is included as a component of GDP, it is impossible to cut spending without the GDP being reduced. In other words, government expenditures bias the GDP. Therefore, the measured impact on GDP would not be a contraction of the private sector per se, but merely a double-counting of the reduction in spending. Consider what happened after World War II. Then, the economy “contracted” by -1.1 percent in 1945, by a gargantuan -10.9 percent 1946, and then again in 1947 by -0.9 percent on the heels of major defense cuts. But was the private sector really contracting? Or was it just government spending being reduced as the nation came off its war footing? Because spending is included as a component of GDP, it creates a disincentive for Congress to ever cut spending. Meanwhile, it misleadingly puts those cuts on the same footing as the tax increases that are set to take effect on Jan. 1. There, CBO estimates that if marginal income tax rates, estate taxes, capital gains and the alternative minimum tax all increase, GDP would contract by -1.4 percent. The impact there truly would be felt across the entire economy as it would impact every single taxpayer. 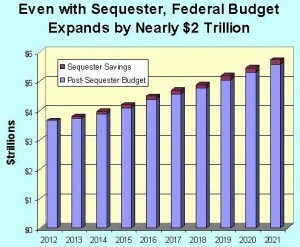 Those higher rates of taxation would then be permanent, whereas the spending cuts are only temporary. As reported by Mercatus Institute senior fellow Veronica de Rugy at the Washington Examiner, after the cuts in 2013, spending will increase over the remainder of the decade. That makes the tax increases at year’s end by far the greater danger to real economic growth, not the temporary, one-time sequestration. Congress leadership and the White House would do well to remember that as the nation rapidly approaches the fiscal cliff.